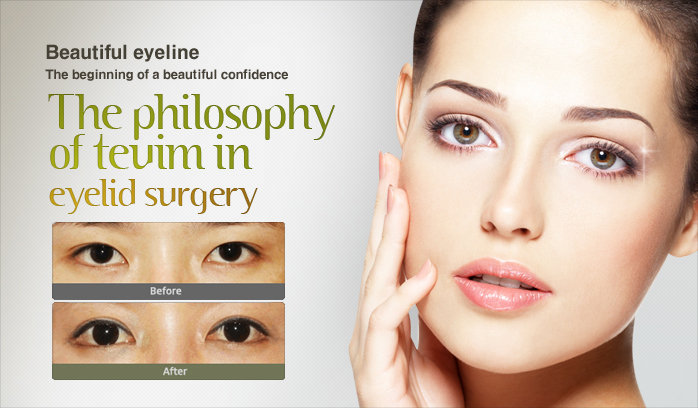 The beautiful eyes are not created by a double eyelid surgery only. The width and the height of an eye should be exposed properly, and natural harmonization of a pupil with eyelashes and a double eyelid line make eyes look beautiful. Over generations, people want more natural and clear double eyelids, and they also want to have attractive images of eyes which can look different from other people’s eyes. So, the Magic epicanthoplasty was created. Usually, epicanthoplasty is known as a surgery for just extending the eyes considering its skin structural change for forming a double eyelid. However, Magic epicanthoplasty has suggested a new paradigm to the double eyelid surgery and it is unnecessary to hesitate even in bad conditions such as having severe Mongolian folds, and it can create an excellent double eyelid line and nice expression of the eyes. Teuim plastic surgery is always trying to create beautiful and admirable eyes all the time through proper operation techniques for the individual's eyes from the abundant experiences in Magic epicanthoplasty and structural double eyelid surgery. We will provide you the maximal beauty that can be expressed through your eyes.